So I was talking to Brian Allex at dinner the other night and he told me he almost got into a McDonalds commercial. I mentioned (as I always do) that I wanted to be in a commercial too…as a voice talent. He said he gets demos all the time from folks. I said I need a demo too….thus I made one. The Background: I thought I would re-do another movie trailer, maybe a Don Lafontaine classic. Unfortunately, there is no website that catalogs movie trailer scripts. There are also none that give away the music behind the trailer (although there are some that charge). So I decided to make my own trailer, with my own music. The Interview: As I was getting into the mindset, I started thinking about myself as voice actor. I watched some interviews with Don L, and then decided my demo should also contain background info….my story as a voice actor. So I wrote a self-interview too. This was the funniest part to me. It was actually much longer than made it onto the demo, but in the interest of time I cut my own interview short. The Music: Fortunately there is a lot of good info out there on suitable classical music for movie trailers. The one that came up over and over was Carmina Burana by Carl Orff. The Trailer: Surprisingly easy to write. I did a little research, but they are pretty formulaic and easy to poke fun of. “In a world..”, “On man…”, “Renegade…”….anything dire, immediate, short, and punchy. The Mix: I use Adobe Audition (formerly Cool Edit Pro) to mix audio. I know something about that from my limited experience recording music, and I have a pretty decent microphone that picks up what little depth and richness I have in my voice. 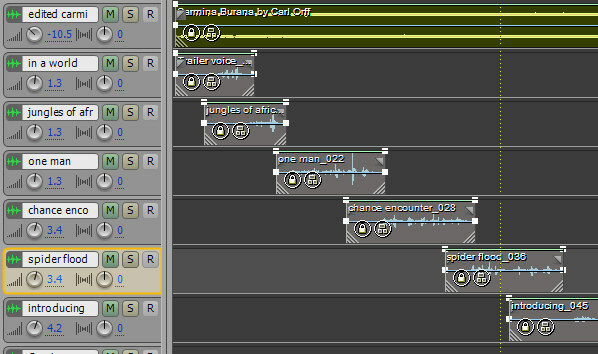 I didn’t use alot of effects on the tracks (echo, or enhancing the bass of the vocals); its pretty much how I sound. You see I recorded the lines one at a time. The trailer definitely wasn’t all one take. The interview was though. The Environment: I did drink a bottle of red wine in preparation. Alcohol dries your throat out and deepens your voice. I didn’t smoke any cigarettes. I don’t like to smoke. I assure you the wine was not enjoyed, but only drunk in pursuit of the art. The Result: Here you go. With the recession looming, I figure its time to diversify my interests. You never know when you might be forced to consider a career change.